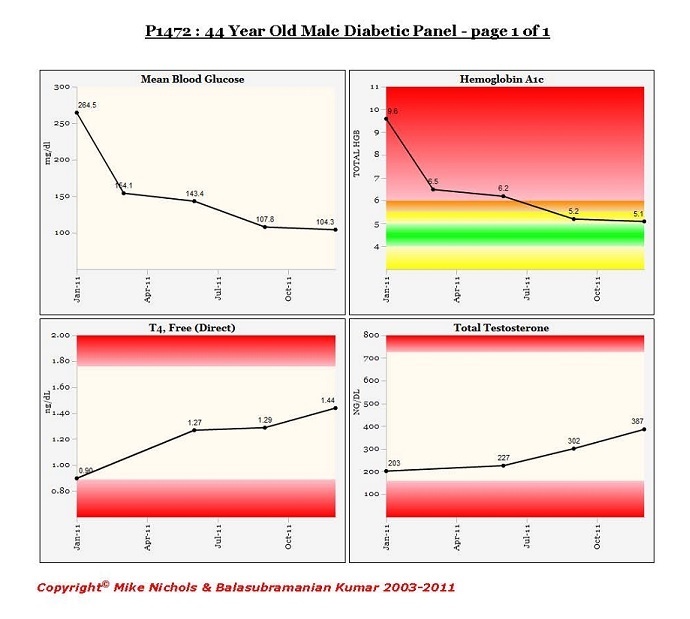 For those of you not familiar with the metrics of diabetes, understand that he went from a very poorly controlled diabetic to a state better than most non-diabetics. His testosterone nearly doubled and his main thyroid hormone (T-4) went from borderline failure to upper levels of normal function. Everything got better. Before we began I made sure he was off all medications, had him do a cardiac nuclear stress test which showed areas of ischemia, blockage, and then very carefully began him on a workout routine always monitoring his heart rate limit and duration of exercise. He very strictly followed my diet guidelines and he and his very professional trainer worked carefully within my training protocols. So, I know how he accomplished such a transformation; what I do not yet comprehend is his level of dedication, precision and steadiness at achieving his goals. He is a hero, using that word in a strict sense. He saved his own life and, by example, will transform for the better the lives of those around him. I want to celebrate his life with those of you who read my blogs. We have not yet retested is heart but he is currently working at such a high level of athletic output that I know his problem, if not gone already will soon be; for, after all, his HDL and HDL 2b and triglycerides, and many other things besides, all got better too. For those of you puzzled by the improvement in thyroid function and testosterone, there is much to tell, but the simple take away is that nutritious food supports all good things and protects against many bad ones. what kind of diet did this guy go on? for example i saw your website that quinoa raises estradiol were there any other foods besides quinoa and all grains that he had to take out of his diet? and what foods did you recommend for him to eat? My Step One diet; it should be on this site somewhere. This is a sporadic blog site for me but I am reasonably certain it is here. If you don’t find it remind me and I will post it.